Interaction designer and sports trader. I run Bettin.gs. Big news today, as it is now possible for all you Bettin.gs Pro subscribers to charge for other people to see your bets. Here’s how it works. 2. When registering your next bet, check the “Charge X to see bet…” checkbox. 3. As someone wants to see the bet, he is asked to pay for the bet via PayPal. Most of the times he can choose to pay for the bet, a package per bet or for a subscription (depending on the value of the bet). As the payment has been made he has access to the full details, as usual. 4. Bettin.gs will send you your part of the payment (75%!) as soon as you have reached a certain level. Please read the terms available on your Settings page. This is the absolute easiest and most lucrative way to get paid for your bets online today. Feel free to try it out today and if you have any questions whatsoever, just let us know and we’ll listen. The Bettin.gs database is prepped with events from the Olympics in Rio for you to enjoy. Try entering the event you’re betting on and it will help you fill in all the details you need. If you’re unsure about how to find it, check out how Betfair does it. Bettin.gs get all the data from them so chances are they’re named alike. Also, be sure to use a certain tag for the summer games so you can follow up later. I’m sure you want to know how much you won on the #Rio2016 basketball, swimming and archery. If you’re betting on track and field, you might want to use a tag for #Rio2016, one for #Trackandfield and adding #Running, #HighJump and #LongJump to keep the stats separated. Here’s something we shared in the newsletter yesterday, which I’m also sure many of you that missed it are curious about. New football seasons are about to start and we’re very lucky to have our friends over at Secret Betting Club to do the hard work for us. 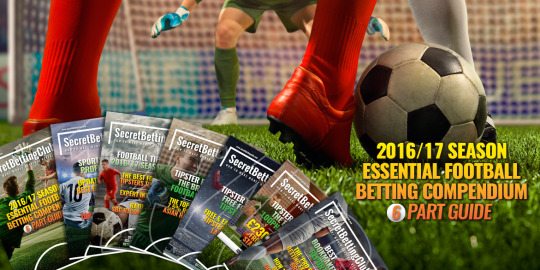 They’ve put together a 6-part guide will help you find the best tipsters, systems, bookmakers & exchanges to make the new season a success for you. Both Parts 1 and 2 are out now, whilst parts 3, 4, 5 & 6 of the Essential Football Betting Compendium will be released in the next fortnight. Part 3: Tipster Review 1: An exclusive review of the fantastic Brazilian Football Tipster that SBC have been tracking for 18 months – during which time he has scooped a 7.5% ROI from more than 750 Asian Handicap bets. Part 4: Tipster Review 2: Another exclusive review, this time of the FREE Football Tipster with a fantastic 12% ROI record in the European Leagues – especially in the Correct Score markets. SBC have a full interview with him plus details on how you can follow for free during the whole of the 16/17 season. Part 5: Tipster Review 3: Their third and final review hones in on the amazing Football ‘Loophole’ Tipster, who made £2302 profit from just £3006 staked in 2015/16. He utilises bookie specials, accas and shrewd low-risk bets to make easy profits. It’s an ideal service for new SBC members and for those of you looking for something different. Part 6: Best Bookmaker Report: Read about the 4 betting exchanges and brokers you need to use – those that offer the best, most competitive odds and lowest commission rates. Includes exclusive interviews, reviews and analysis on each option. I’m sure you’ve all seen or used the option to ”cash out” before the event you’re betting on is over. It’s a very convenient way for you to secure a profit or reduce your losses and calm your nerves at the same time. It’s all good, right? What’s happening is that the bookies are using your insecurity to increase their margins even more. It’s actually one of the smartest things the bookies have come up with in a pretty long time. Most of the time, someone making a bet with the bookies are betting on very small margins and, as you know, most of the time the odds are in the bookies favour. Now, as they are able to offer you another bet, you can be sure that the odds they’re offering you to use for ”cash out” aren’t even close to the true odds for the market at the time, and so the potential margin you once had on the bookmaker is most definitely gone. What you should do is treat the market you’re betting on the same way as you did before it went live. You wouldn’t dream of placing a bet without comparing different bookmakers odds before the game, so why would you do that during the game even if there’s a big green flashing button with definitive winning sums written all over it? If you must bet against your initial bet (which is actually what’s happening), shop around to find the best price, or better yet, if you’re using exchanges, lay the bet at the price you think it’s worth to give yourself a fair chance and fair odds. Don’t fall into the trap and let one bookmaker dictate the odds for you for the sake of simplicity. Make sure you get the correct value by playing them against each other, or use betting exchanges like Betfair or Smarkets to make sure you get the odds you want and deserve! As you probably know by now, we’ve recently released the possibility to register Lay bets, which makes tracking your trades even easier. The nice thing with this is that if you’re an active Betfair user you can get all your bets into Bettin.gs quite easily. If you’re not a Betfair user yet, we’re happy to offer you a kickstart with a 100% deposit bonus up to €200, or 2000 SEK if you’re a Sweden resident. We highly recommend that you get a Betfair account as a complementary option to your usual bookies. If you’re serious about your betting, you owe it to yourself to at least try and see if it’s for you and how you could use an exchange to help you make more money, so why not at least start using their Sportsbook and then take the step to the exchange and start trading? Sign up now and start using Betfair by choosing an option below. if you’re using exchanges like Betfair, Betdaq or our new favourite Smarkets, you’ll be happy to know that we’ve added for laying bets att Bettin.gs. To do this, you simply enter the same information about the event you’re betting on, but before you press “Add this bet”, select Lay in the Type drop down and you’re done. Lay bets, or betting against an outcome, uses another calculation for ROI and of course another way of calculating the result. That’s nothing you need to worry about though, since it still all is done automatically once you settle or update a bet. This feature will be eventually be available for Pro users only, but it’s open to everyone for a few days to let you try it out. Good luck with your trades and let us know how it works out for you! 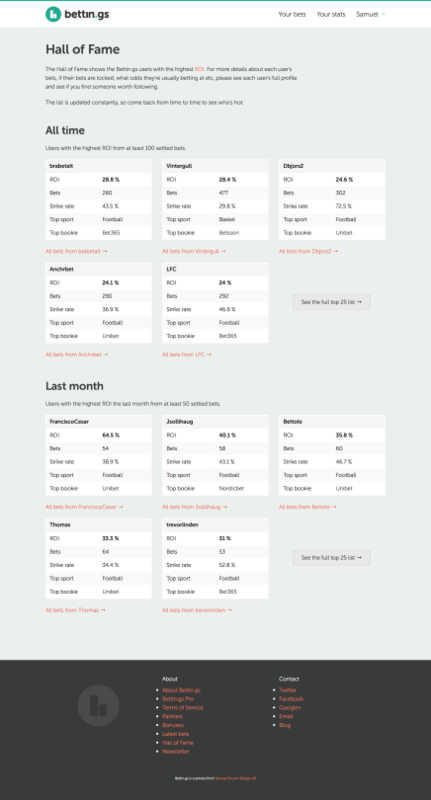 After using Bettin.gs for a while, improving your numbers and stats, perhaps overheard someone’s stats or ROI on Twitter or found a user to follow, I bet you’re wondering how you stack up compared to other users or wondering who the top users at the moment are. Well, wonder no more. Last week we released the brand new Hall of Fame section, listing the most successful users (i.e. the ones with the highest ROI) in one place. The Hall of Fame is divided into top users of all time and from last month respectively, to help you find who’s succeeding over time and who’s hot right now. Top users for last week and the possibility to only show active users are coming shortly.